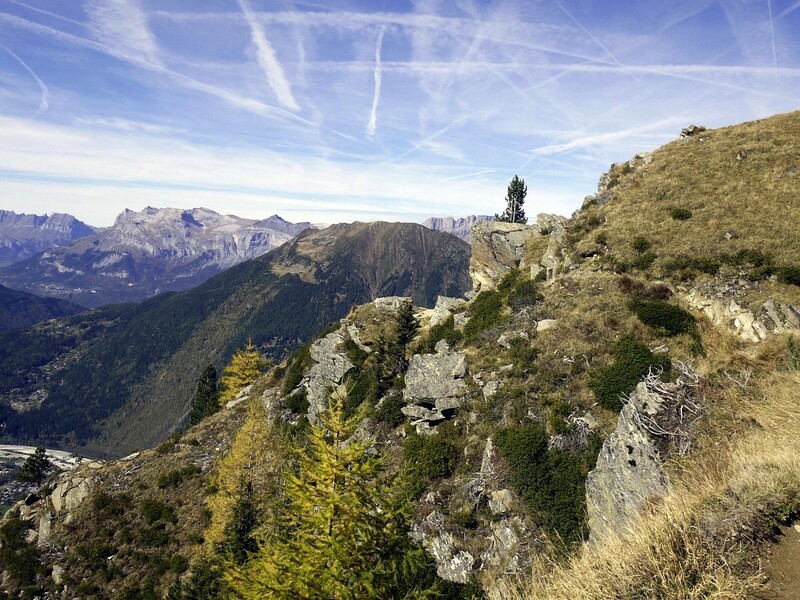 La Jonction hike is one of a kind: long, strenuous, but hugely rewarding. 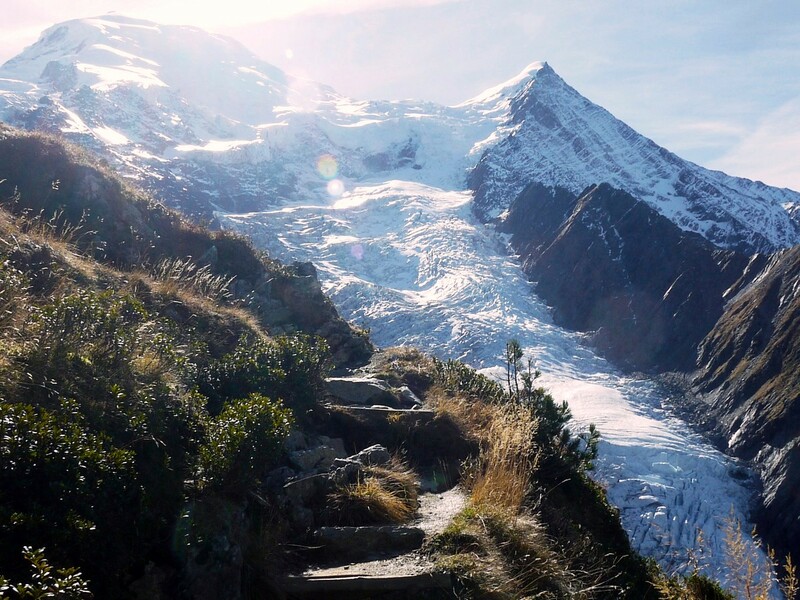 Hike up a ridge on a zig-zagging path, showing you the serac-riven glaciers on either side. At the top there is a beautiful glacial-amphitheatre. 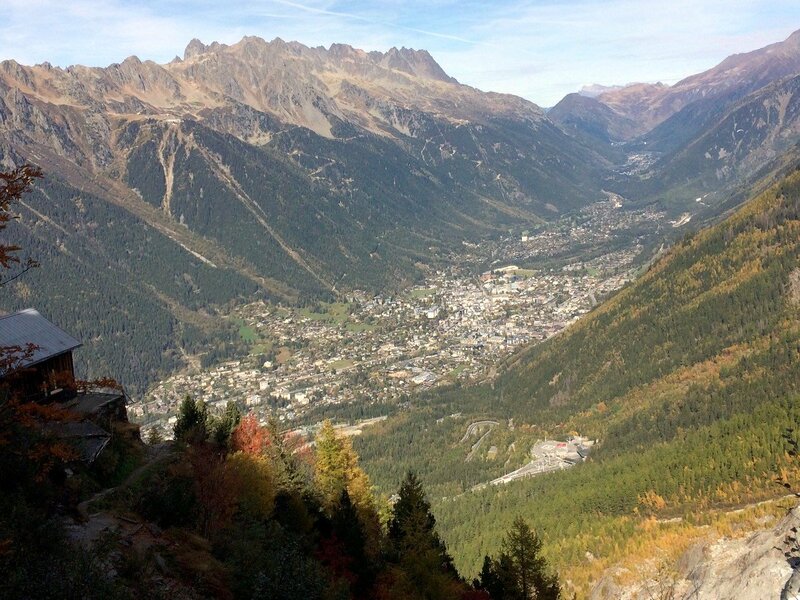 A great and challenging hike in Chamonix. The No.2 bus stops at the base of the Bossons chairlift (Check if the chairlift is open first). The chairlift takes you directly to the Chalet du Glacier des Bossons for the start of the walk. If the chairlift isn’t running, the walk is clearly signed from the base. Add 1.5 hours if walking from the base of the chairlift. No. Bivouac permitted sunset to sunrise. Most people use the chairlift, however if you have your own transport, you can drive up past the base, following signs to the village of Le Mont, and park here to save a bit of time. Again, the path is clearly signed. Add an hour to the total time if going from Le Mont. Once you’re at the top of the chairlift, step out onto the terrace of the cafe at Châlet du Glacier des Bossons for an impressive view of the end of the glacier. Take a peek at the exhibits commemorating the two Air India crashes and the debris that the glacier is continually exposing from them. There are also photos of the glacier over the years, documenting its retreat. From here, turn away from the glacier and start the hike to La Jonction. Follow the path upwards through the woods. After about 40 minutes, the trees begin to open out and reveal the scenery. 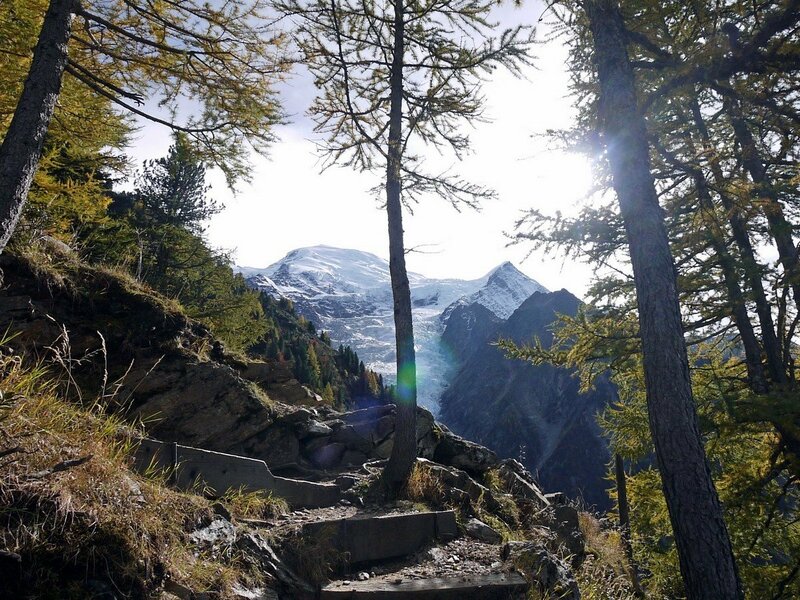 Just below the Chalet des Pyramids, the steepness of the cliffs means you can look directly down into the crevasses through the larch trees – stunning in autumn. The Aiguille du Midi looms above you – look out for the cable cars which you can see coming and going. As you continue hiking up, the forest thins out, allowing you to see the incredible landscape as the path twists from one side of the ridge to the other. On the right is Mont Blanc and the Taconnaz Glacier. 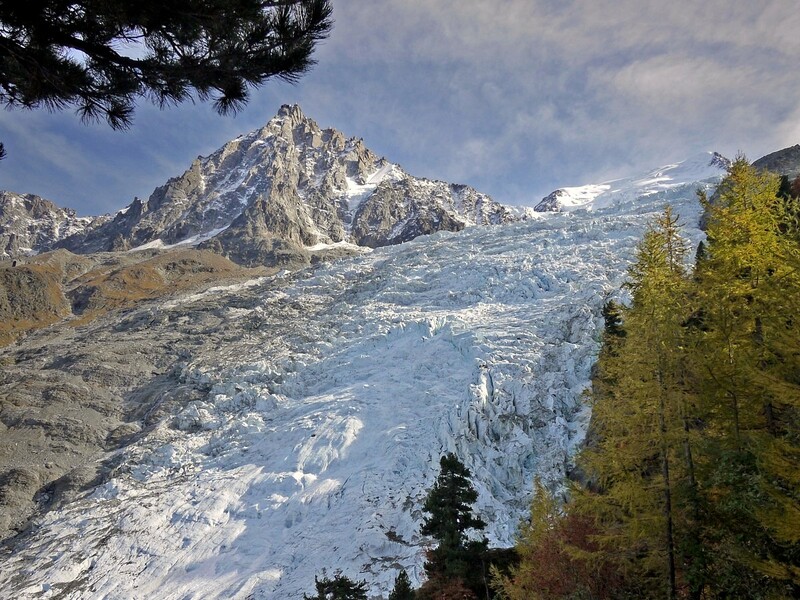 On the left, the Aiguille du Midi and the Bossons glacier – the biggest vertical drop of any glacier in Europe, and the fastest moving at 300m per year. This high speed (for a glacier!) means it is very active, and you’ll almost certainly hear the creaking and groaning of its movement, and the crashing of serac falls. Its speed also keeps it much cleaner than many other glaciers – spectacular to see the flashes of white through the larches. The hiking trail is fairly clear at this point, and wherever there is any doubt, the route is marked with yellow paint. After another hour or so, you leave the trees entirely behind, walk up across the high grassy open ridge and along the flank of the Bossons side. This is a good place to see Chamois, who graze in the open spaces. The path to La Jonction now turns upwards and the last hour is quite demanding, over rocks which have a few sections of peg footholds. Follow the yellow dots carefully here – they trace the easiest path through the rocks. In some places, the route looks quite technical – but keep checking for the dots and they will lead you along a system of ledges and platforms which are straightforward. We find this section to be easiest without poles on the way up – it’s not quite scrambling, but it’s useful to have your hands free to steady you from time to time. You’ll pass the huge boulder of the “Gîte à Balmat” with its distinctive roof-like notch underneath, where the first ever summiters of Mont Blanc spent the night – a plaque on the side commemorates the event. From here, the last ten minutes are nothing short of a revelation, as the scenery opens out above you to reveal the glacier, close enough to touch. It’s impossible to capture the majesty and drama of La Jonction in photos – take some time to wander around the rocky prow and take it all in. 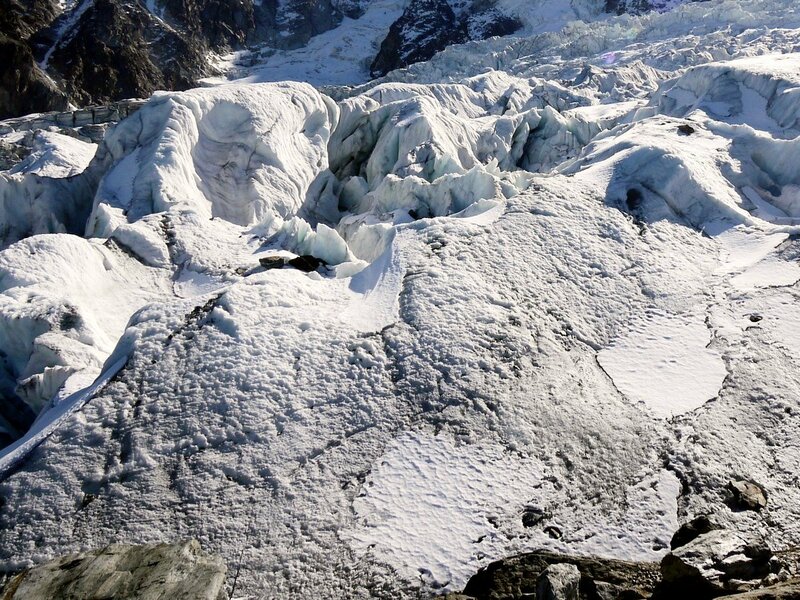 Never step onto the glacier – there can be entirely unpredictable collapses. 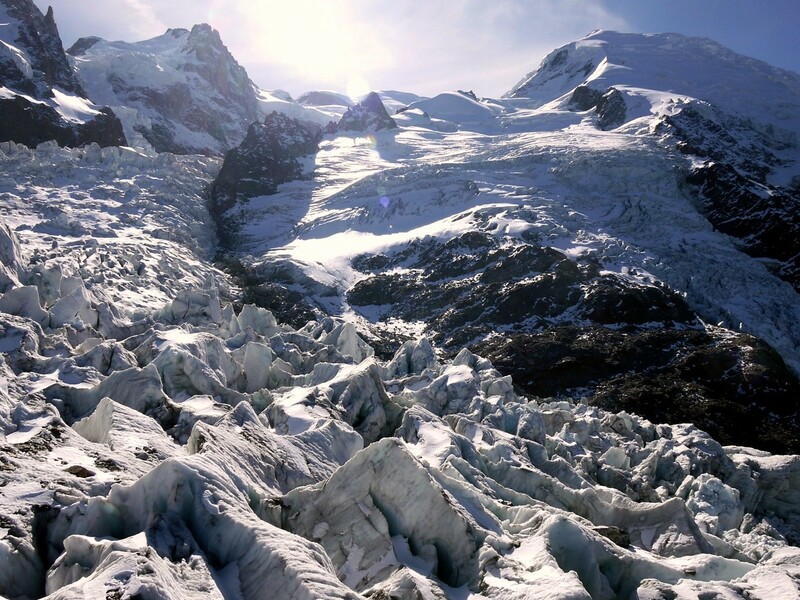 The frozen waves of the seracs pouring down from Mont Blanc are an unforgettable sight. When you’re ready, return the way you came. We prefer to make good time on the way up and have lunch at the top. Then you can go more slowly to appreciate the view and take pictures on the way down. Then you do not have to rush your time at the top. The views are just as good in both directions. 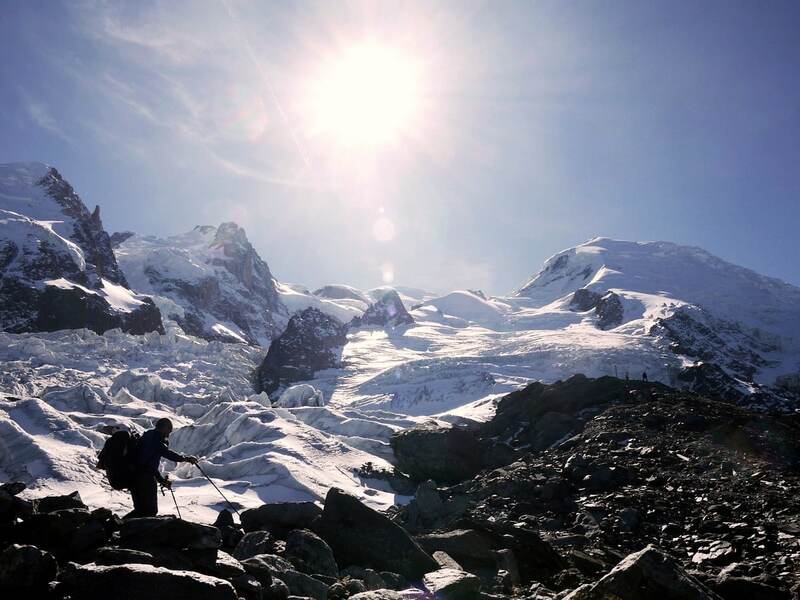 It’s possible to bivouac at the top and this is a wonderful experience - the glacier creaks and groans around you and you can enjoy the high mountain setting in all its magnificence. It is cold! Take plenty of food and water, the hike to La Jonction is a massive hike, and the altitude is dehydrating. Set off in very good time in the morning and make sure you know the times of the last lift and bus if needed. Starting early also means you do as much as possible of the ascent in the shade. This is a terrible choice for your first walk of a holiday. It’s a big day at altitude - get acclimatized a little first. This trail is a long way uphill through the forest. It’s well worth it! But this is a path that gets exponentially better as it goes up. If you have any doubts about your ability to do 1400m vertical, we don’t recommend it, as it would be very frustrating to have to turn back just as it gets good. You want a good few days of settled weather for this one - if there has been recent rain, it can get slippery. Never go up here if there is even a hint of bad weather. The exposed ridge is extremely dangerous in a lightning storm and do not attempt if there is snow. 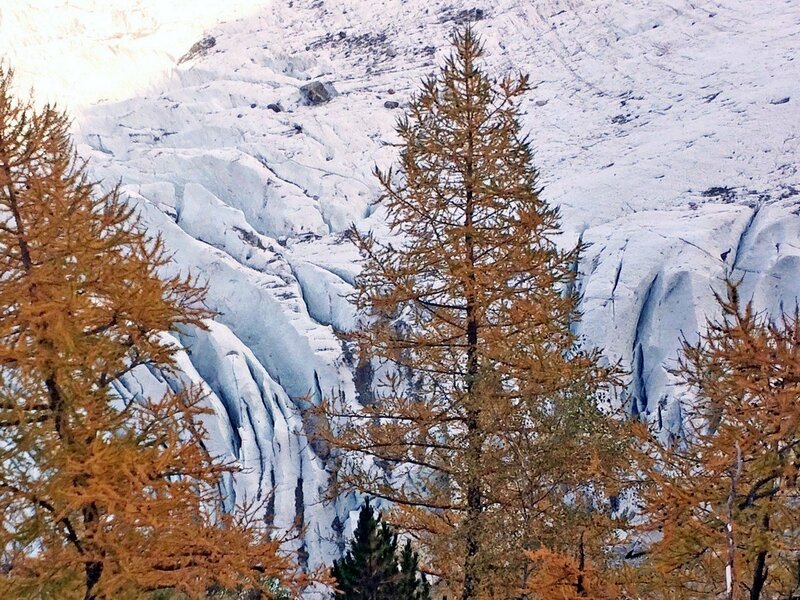 The hike to La Jonction is particularly beautiful in autumn when the larches turn gold.